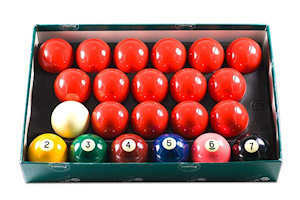 Made from the famous Aramith phenolic resin, these balls are a combination of unique craftsmanship and high technology, built to provide consistently superior quality. Perfectly round and balanced pieces, uniform weight and hardness, brilliant colors, friction resistance, roll, and reaction are just a few of the key features that gave Aramith its worldwide reputation as the premiere ball. This set is available in 2 1/4 inch only. Includes all 21 snooker balls plus cue ball.